The flying squirrel is growing in popularity as a pet. Caution needs to be used to ensure a flying squirrel is only obtained from a reputable breeder. Squirrels obtained as babies will still need to be fed with baby formula and a syringe for several weeks, and they'll need time to bond. Therefore, owners need to be prepared for their new pet to be time-consuming in the beginning. Bonding with a pet flying squirrel is very important to ensure he feels secure and happy with you. If there will be more than one person caring for him, bonding should be done with each person equally. To create a strong bond, carry him around in a shirt pocket or pouch for several hours a day during the first several weeks. The best place for a pouch is near your heart, but if that's not possible, make sure he can feel your body heat. Hand feed a young squirrel at first to further the bonding. Choose a cage made predominately of wire with spaces of no bigger than half an inch, to allow for good air circulation. For very young squirrels, a small cage is appropriate, but you should be prepared to provide a larger cage once they reach 6 months in age. Place plenty of branches or perches for him to jump and exercise. Line the bottom of the cage with shredded newspaper; he will select one corner to defecate in, making it easier to clean. Place a pouch or box high in the cage and line with cotton or wood shavings. This is a nesting box, where he will sleep and go when he wants to be alone. Be sure to keep fresh, clean water available at all times. Water can be placed in a water bottle or a small dish, and either needs to be washed each time water is refilled. Offer commercial squirrel or hamster food daily, as well as fresh fruits, nuts and seed. Hard nuts such as pecans and walnuts will help keep his teeth from getting too long. Remove any uneaten fruit after 12 hours to prevent bacteria and odor. To ensure he gets the needed calcium, give fresh orange slices twice a week or sprinkle calcium powder on his food. Live treats such as meal worms or wax worms can be given on occasion. It's also recommended to place a rabbit salt wheel in the cage. 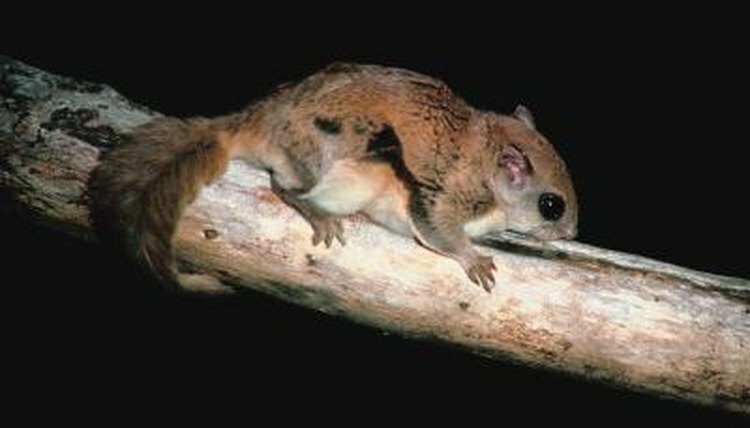 The flying squirrel produces oils that protect his body from pests such as fleas, lice and ticks. They are also safe from rabies -- there has never been a documented case of a flying squirrel contracting the disease. While no vaccinations are needed for a flying squirrel, he should be taken to a veterinarian familiar with exotic animals once per year for a health checkup.